It happens quite often that in the event of a fracture or an injury to the bone, X-ray does not detect and injury. In fact, 90% of the time, X-ray fails to identify certain types of injuries, which lead both the patient and the doctor perplexed. In these situation, a doctor has to rely on higher modalities of CT and MRI which are not only expensive for the patient but at many times, really uncomfortable. But not any more, Ultrasound is also possible for bones and joints, and proves to be quite effective in reaching diagnosis and facilitating treatment especially in emergency situations. 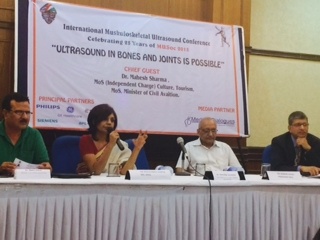 Musculoskeletal Ultrasound Society (MUS) organized a press conference to educate the media and the public about the existence of this modality, which is quite predominant in the west, and now slowly becoming popular in India as well. With the same machines and the same probe, radiologists can now perform the ultrasound of bones, joints and muscles to identify fractures, ligament tears, bending of bones (common in children). This is specially useful for those patients are claustrophobic and do not want to do under the CT or MRI machine as well as those who cannot be prescribed MRI due to presence of pacemakers, implants, etc. On the use of the modality Dr Sudhir Gupta, CEO Cygnus Group of Hospitals and President, IRIA said, “ This modality is commonly used in the US, for the past 20 years, but quite new to India, primarily due to lack of awareness on the part of the patient, orthopedician as well as radiologists themselves. Its an important modality, providing a valuable alternative to CT and MRI in many situations including emergencies. Not to mention, it’s a much cheaper alternative to MRIs.